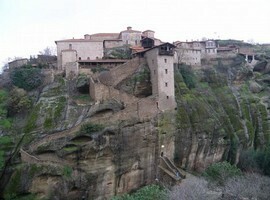 Shortly after Kalambaka lies the picturesque village of Kastraki, built at the base of the giant rocks of Meteora. 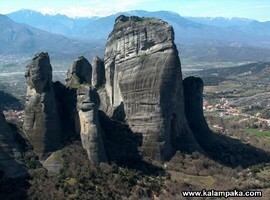 The huge rocks of Meteora lie between the mountains Koziakas and Antichasia. 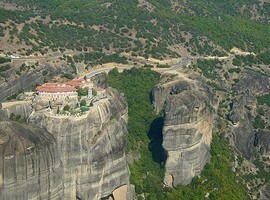 This masterpiece of nature reveals all its glory for centuries, and is a unique geological phenomenon of beauty and an important monument of Christianity. 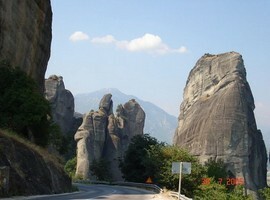 The imposing cut off between the rocks, the height of which reaches in some cases 400 m, is a unique geological phenomenon. 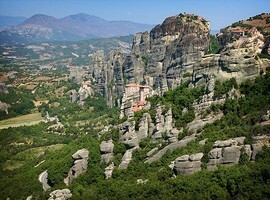 The rocks cover an area of about thirty kilometers. 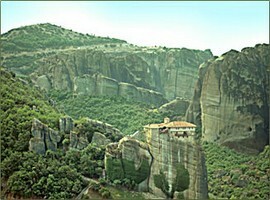 Meteora is, after the Holy Mountain, the biggest monastic complex in Greece. 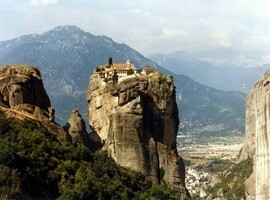 That’s why they have been declared the second Mount Athos and continue the monastic tradition for nearly six centuries Historical evidence suggests that the monasteries of Meteora were thirty. Of these thirty only six still work today and receive many pilgrims every year. 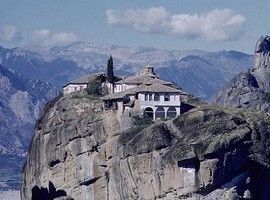 The remaining are uninhabited and dilapidated. 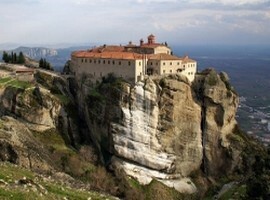 Most of them were founded in the 14th century. 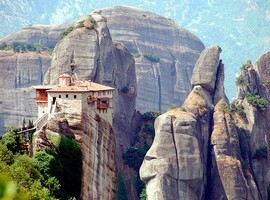 In view of the sacred rock, the visitor is stunned by the impressive grandeur of this gigantic stone cluster. 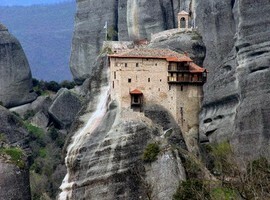 The ascetic huts on the rocks reveal the undeniable presence of the first monks devoted body and soul to God. 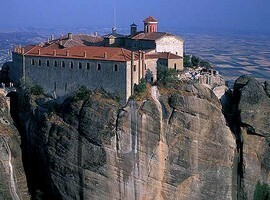 The first monasteries were built with great care and skill during the 14thcentury. Over the years some of them were rebuilt and other went through major repairs in order to be completed and be given their final architectural shape. 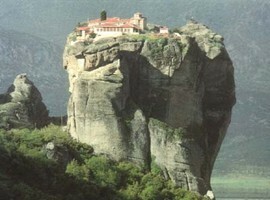 Since then, they stand on the tops of the rocks giving the impression that they are their natural finish. 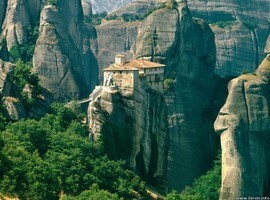 The ascent to the monasteries was done previously with scaffolding embedded in beams wedged in the rocks, with a net and later with ladders. 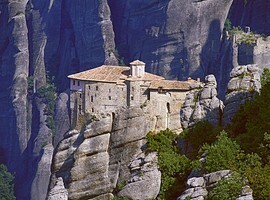 Today the pilgrim visitors use the stairs carved in the rocks, thus ensuring a comfortable and safe ascent to the monasteries. 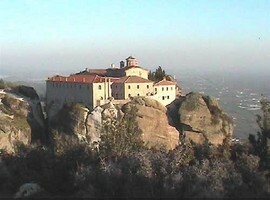 The monasteries of the Transfiguration, Holy Trinity, St. Nicholas of rest, and Barlaam are inhabited by monks, while the Monastery of Agios Stefanos and the Monastery Roussanou are inhabited by nuns. 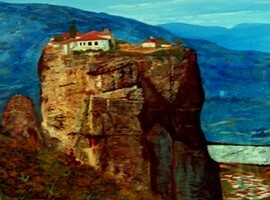 Monks, priests and great painters of the era, as Theophanes and Fragos Katelanos, painted with their murals the temples of Meteora. The Lady Threnody, the Crucifixion, the Nativity of Christ, the martyrdoms of saints, are some of the murals that adorn the interiors of churches. They have rich color that is sometimes lively, sometimes gentle, life and naturalness has been given in the expressive faces and body movements. Some paintings, however, have suffered severe damage from attacks of vandals who did not respect the sanctity of the church space, and yet others have over them the indelible signs of time wear. 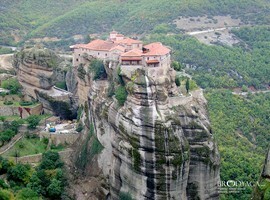 Meteora have preserved treasures, relics and many miniature works. A representative sample is the masterpiece of miniature wooden temple located in the church of the Monastery of St. Stephen. Icons, the oldest of which are now kept in the sacristan of the churches, Holy Cross Wood, Episcopal bars, gold-priestly vestments, manuscripts, Gospels, utensils for operational purposes, lead seals, silver reliquaries are some of the museum exhibits that visitors can admire. 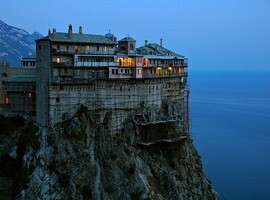 From a historical point of view very interesting are over a thousand manuscripts and precious value series of Byzantine and post Byzantine documents are saved and preserved in the archivist of the monasteries.